Utagawa Kuniyoshi (1797-1861) Kanadehon Chushingura, act 11, 1854. Oban yok-oye. A very nice print from Kuniyoshi’s 1854 series of the Chushingura. We see here the culmination of the attack of the 47 Ronin. A confusing issue for scholars is that censorship restrictions meant that frequently the historical characters were given the names of the theatrical players in the kabuki version of the story, as is the case with this print. This is perhaps the most famous drama of kabuki theatre and the real historical characters are still revered today at their shrine and in films, books, plays and cartoons. The true story tells the suicide of Enya Hangan who in 1701 was forced to draw his sword in the Shogun’s palace by the goading of the courtier Moronao. Hangan is obliged to commit suicide for the offence and his retainers become Ronin, leaderless samurai. They vow revenge and the play revolves around their plotting and preparation, culminating in the storming of Moronao’s house and his eventual assassination. It is interesting to compare this to the Hiroshige Chushingura on this page of 1836. Hiroshige decorates the border with the Tomo-ye crest and dresses the Ronin all in black. 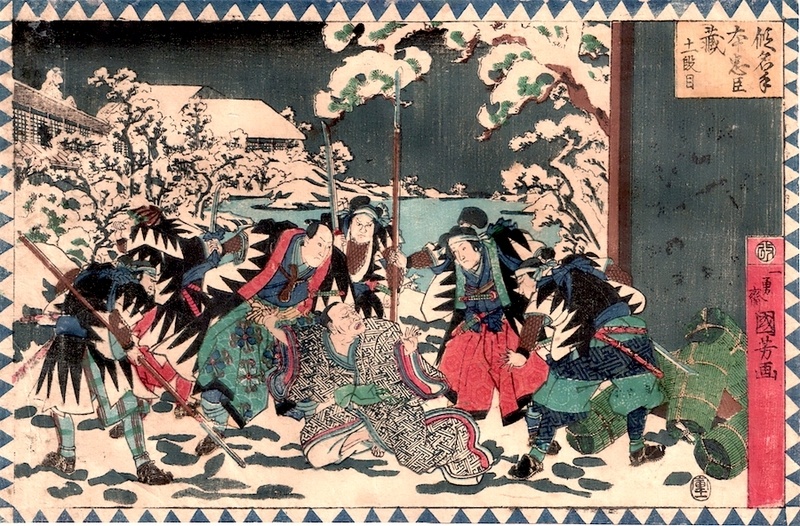 The convention (Kuniyoshi’s design) to show the Ronin in the distinctive black and white dog tooth uniform is evident and Kuniyoshi uses it to embellish the border of this series. A little-seen print series this piece is a good impression with strong colour and is in good condition. There has been some toning to the paper, overall good.